There are thousands of reasons for riding a bike, but the pure pleasure of being out on wheels, powered by your own body, on a day like this takes some beating. We’ve had a tough UK winter, but sunshine, blue skies and glorious scenery make it melt away like morning frost on a meadow. I’m in Burgess Hill, Sussex to meet the Progressive Cycle Coaching Development Squad, a team of young riders managed by a local racer turned coach and personal trainer, Dan Bennett. “The team is a vehicle I use to promote my business, but I also do it to help young riders learn the craft of cycling. I try to help them train correctly, to have the right mental approach to racing, and to help them avoid the pitfalls that can undermine talent,” he says. Bennett – along with helpers like co-sponsor Trevor Holmes, who drives me and my camera around the route today – has done some good work so far. The squad has set up contacts in Belgium and France, and riders like Tom Copeland, who’s now a pro with Sigma Sport, and Matt Jones have graduated through the team. Bennett’s approach is as good as his word. The team is split into youth, junior and under-23 groups, with progressive steps worked out for each group. All have a clearly mapped out programme of training, racing and instruction. Days like today, when Bennett tries to gather everybody together for a morning ride and afternoon seminars, are key parts of the programme. So, after a briefing from Bennett on how the ride will be done, where they’ll go and exactly what the objectives are, they’re off. There are nine men to begin with, ages ranging from 16 to 23, and they have around 75 miles ahead of them. The one girl in the squad, 15-year-old Sara Gent will join them halfway round. “The guys raced yesterday, so today is strictly an endurance ride,” Bennett explains as we follow behind. When Bennett whizzes through the different programmes he’s got going this year you get the feeling that here’s a man who can split himself in two. He’s got everything from local track leagues to a possible dip into the Premier Calendar mapped out. “It’s demanding but I enjoy it. It’s how I market my business, so I can justify the time, but the big satisfaction is seeing riders develop, and feeding those like Tom Copeland on to bigger things,” he says. Sussex has produced some good bike racers, notably local hero Sean Yates, who’ll feature in one of these rides on his home roads in the near future. But as well as training rides these roads have seen some great race action, as we’re reminded of when the route slips past Ditchling Beacon. Yates was part of the field when the Wincanton Classic, a single-day race featuring many of the top names in the European peloton, climbed the Beacon before finishing in Brighton in 1990 and ’91. “And when the Tour de France came here in 1994 they also used some of the roads we’re on today,” Bennett points out. Good for training, good enough for the Tour de France, the roads of Sussex have a lot going for them, especially today. 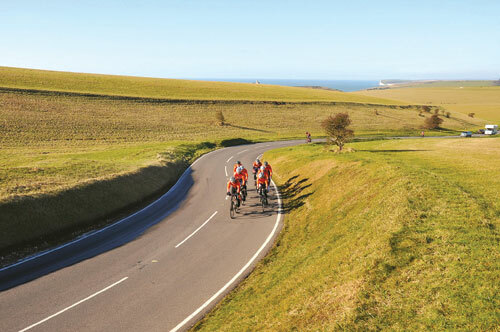 The sunshine is glorious, the early morning nip of a nine o’clock start passes by the time the group roll along the foot of the South Downs. The only mishap is a puncture for Charlie Fawke, but the rest wait and two come back to help him. They pick up Sara Gent just before a tough climb up onto the Seven Sisters section of the South Downs. It’s not exactly the ideal place to join a bunch of warmed up young guns who can’t resist putting the wheel on each other to see who’s strongest. But Sara is on British Cycling’s Talent Team, she’s well coached by Brighton’s Lee Povey and she’s got a top local bike racer from years back, Alan Limbrey, in her genes. By the summit she’s kept the boys honest, and as the ride progresses she just gets stronger. The loop around Beachy Head provides glorious views on the English Channel, which looks like the Mediterranean today. Eastbourne could pass for Monaco. Well, it could if you squint. A sharp descent and the group heads back, re-tracing the route out, with some added loops to bring up the distance. The coast road is quite busy, but traffic soon thins out behind it. Bikes seem to rule the Cuckmere and Ouse valleys today. There are loads of groups out and for a while the Development Squad gets caught up with a Lewes Wanderers club run. It’s a great sight, men and women of all ages sharing a special day. Back in Burgess Hill each of the team takes time to thank me for covering their ride before heading for the showers. Then they’ll sit down and plan their next steps in becoming better bike racers. They’ve done some good miles today and added to their fitness, so those boxes are ticked. But so is another, from the looks on their faces at the end they’ve enjoyed today; enjoyed the riding, the sun, the company. Races are finite, but the joy of cycling lasts forever. The two areas this ride covers are the Low Weald, which can be deceptively hilly, and the South Downs, which is hilly too. Sustrans has a load of cycle routes covering both areas on its website at www.sustrans.org.uk. Cycling is popular here. There are 17 cycling clubs in the county, and six of them are part of British Cycling’s Go-Ride scheme, so they are a perfect introduction to cycling for young people. They can be found on www.britishcycling.org.uk in the ‘Club Finder’ section. Sussex also has a velodrome at Preston Park in Brighton. It has a full programme of racing, can be used for training and has produced many champions. The 2007 world junior team sprint champ Peter Mitchell cut his racing teeth there. Head south from Burgess Hill to Hassocks then Ditchling. Take the B2116 east. Turn right towards Lewes then left up the Ouse valley, crossing the river at Barcombe Cross. Continue east to Laughton. Turn left on the A259 and climb up onto the South Downs. Turn right at East Dean then first left in a loop around Beachy Head back to East Dean. Retrace the outward journey, going straight ahead at Lullington Court to go through Lower Dicker, then turn left to Laughton. Retrace the outward route again, but turn right at Barcombe Cross to loop north, crossing the A275 at South Common, before heading back to Burgess Hill.